The world's first self-pollinating white flowered runner bean - sets well even in poor conditions The original French/Runner bean cross variety introduced in 2011 and already a customer favourite. Long, stringless, tasty pods in profusion and attractive white blossom through the summer. TOBY'S TIP - This new type has a degree of self pollination which means they crop better early and late or when unsuitable weather conditions may mean that bees are in short supply. We are really impressed with the cropping and they look and taste just like a runner bean – pods also remain stringless for a long period. What’s more, it is British bred for British conditions. One of the best developments in years! 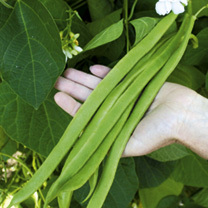 A new generation of ‘super’ runner beans for your best harvests ever, even in poor weather! These ‘super beans’ are the result of 15 years of British breeding to carefully combine the best characteristics of French beans and runner beans, these outstanding varieties will crop heavily even when the weather is poor and there aren’t a lot of pollinators about. Any good garden soil will do, but the best crops are obtained after deep digging and manuring. For early crops sow in pots under cover in April and plant out mid May, protecting against frost. Alternatively, sow outdoors from April onwards, protecting early crops with cloches until frost danger is past. Sow 5-7.5cm (2-3") deep and 15cm (6") apart in double rows 30cm (12") apart. Allow 1.5m (5') between each double row. Thin resulting plants to grow on about 30cm (12") apart. Stake the plants as soon as possible after germination. Harvest August-mid October. Plants reach a height of 1.8-2.1m (6-7'). Double row 4.5m (15'). HEALTH BENEFITS: Good quantities of vitamin C, folate and iron together with fibre. COOKING HINTS: Cut thinly and steam for just five minutes (or boil for three) as vitamins are easily lost. New research indicates that evening watering of the roots increases cropping and pod set. The world's first self pollinating white flowered runner bean. Sets well even in poor conditions The original French/Runner bean cross variety introduced in 2011 and already a customer favourite. Long, stringless, tasty pods in profusion and attractive white blossom through the summer.